If you have Medicare, you can protect your identity and help prevent health care fraud by guarding your Medicare card just like you would a credit card. 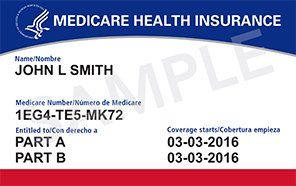 New Medicare cards will be mailed starting in April 2018. Identity theft from stolen Medicare numbers is becoming more common. To help combat fraud, Medicare is removing Social Security Numbers from cards and replacing them with a new, unique number for each person. The new cards will be mailed starting in April 2018 and should be fully distributed by April 2019. Don’t share your Medicare number with anyone who contacts you by phone, email or in person, unless you’ve given them permission in advance. Medicare will NEVER contact you (unless you ask us to) for your Medicare number or other personal information. Never let anyone borrow or pay to use your Medicare number. If someone calls you and asks for your Medicare number or other personal information, hang up and call 1-800-MEDICARE (1-800-633-4227). To learn more about protecting yourself from identity theft and health care fraud, visit www.Medicare.gov/fraud or contact our SHIBA program at 1-800-562-6900. SHIBA is Washington state's Senior Medicare Patrol, the fraud-fighting unit of the federal program.